Happy Halloween! Starz has just dropped a new Ash vs Evil Dead Season 3 trailer and it is a treat. 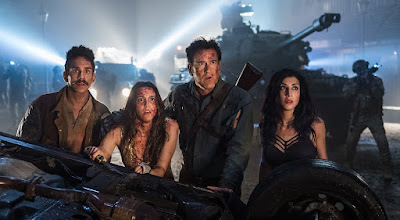 Ash vs Evil Dead stars Bruce Campbell as Ash Williams, the chainsaw-wielding anti-hero tasked with saving the world from evil; Lucy Lawless as Ruby, the unpredictable foe and occasional ally who has strong ties to the origin of the Necronomicon; Ray Santiago plays Pablo Simon Bolivar, Ash’s loyal sidekick and Dana DeLorenzo returns as Kelly Maxwell. Ash vs Evil Dead Season 3 also finds Ash discovering his long lost daughter, Brandy Barr, played by newcomer Arielle Carver. Ash vs Evil Dead Season 3 finds Ash’s status in Elk Grove, Michigan has changed from murderous urban legend to humanity-saving hometown hero. When Kelly witnesses a televised massacre with Ruby’s fingerprints all over it, she returns with a new friend to warn Ash and Pablo that evil isn’t done with them yet. Ash vs Evil Dead will hit Starz on Sunday, February 25, 2018.